The use of technology in the classroom is inadvertently having a profound effect on helping introverted students become more confident. 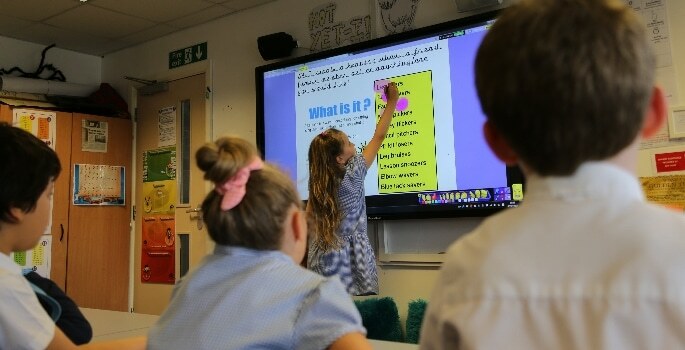 With front of class interactive displays giving students the opportunity to play more of an active role in their learning, presenting in front of classmates is increasingly becoming more of a norm than an exception…. Technology is also encouraging children to work more collaboratively in the classroom, resulting in peers cooperating with each other in small groups to work on assignments and set tasks. Being actively involved in their learning while also able to work at their own pace when necessary, even the least confident of students are participating more during class activities. Outside of the classroom technology still has a place in growing student confidence, for example, class online discussion forums are helping pupils to communicate more. It’s a great virtual space for shy students to post questions to teachers that they might be too timid to ask in front of their peers in the classroom environment. In doing so, we’d expect this to help confidence grow and that those students would soon be putting their hands up and participating more during lessons. Through the 2017 Promethean Grant competition we were lucky enough to meet Mr Hunt and Jamie Berry, from Tottington Primary School in Bury, Greater Manchester. 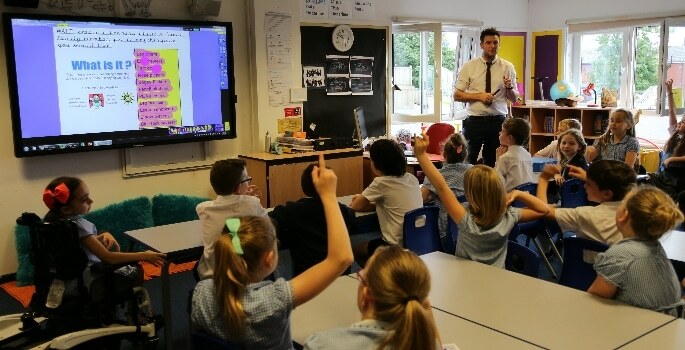 Mr Hunt entered the Promethean Grant on behalf of the school as his class was fed-up with the old, noisy, temperamental Interactive Whiteboard. As a class they enjoy exploring technology and often use games and apps to support their learning. Following an inspiring entry into the competition that saw Jamie take on the role of a news reader, Tottington was awarded a Promethean ActivPanel. Through building our relationship with Mr Hunt – who is a true advocate of technology in the classroom – we learnt how his love of teaching with technology helped to nurture Jamie to become more confident in the classroom. Initially a shy student, the duo’s joint love of all things tech has seen them form a strong bond, and as a consequence, Jamie’s confidence has gone from strength-to-strength, appearing in YouTube videos which have gone on to make him an Internet sensation. Jamie’s confidence continues to soar and he even presented at this year’s Bett alongside Mr Hunt – pausing for autographs afterwards. We’ve also learnt how Tottington, which is an inclusive school and a resourced provision for physically disabled pupils, has been able to help its less mobile students become more involved in lessons through the use of tech. Mr Hunt has been using ActivCast to deliver lessons directly to students who can’t come up to the screen themselves. Through mirroring screens directly to handheld devices it means those students are still fully included in lesson. Involving all students in this way, not only increases confidences but encourages more peer-to-peer collaboration, and ultimately proving that with technology there really is no barrier to learning. As announced by Jamie here, applications for the Promethean Grant 2018 are now open… could creating a video submission help to bring out confidence in some of your more shy pupils? Find out more about the Promethean Grant here.